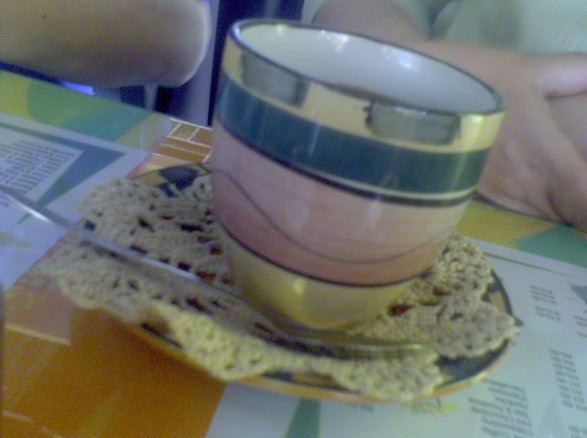 The coffee cup placed in front of me has an authentic granny-crocheted doily beneath it. This is Bloemfontein. I’m sharing a tuna tramezzini at De Rebus in the city centre with Sally and Anina, tannies* who are the encyclopedic reference to the concept. Anina reminds me of a tropical bird, brightly feathered in a blue suit, ornamented with chunky baubles and the most elaborate eye makeup I’ve ever seen; stripes of bronze and azure with shadings of a lilac-marine accenting the outer corners of her lids. Sally is simpler and wholesome, like a bowl of oats. “Are you married Saaleha,” they ask in that concerned inquiring inflection. While their questions are warmed by their Afrikaans intonations, the tone could belong to Aunty Khadijah in Lenasia or Sandringham’s Beryl Rabinowitz. I reply in the negative and steer the conversation towards Anina’s weekend church camp and Sally’s teenage son who gets irritated when she asks him technology related questions. We speak about traditional Afrikaans upbringing, and I draw parallels with my own small-town Muslim-Indian molding. Discussing the death of conservatism is inevitable, and I’m somewhat saddened that while we stride positively forward, we tend to leave behind the modesties of the old-fashioned. My return flight to Johannesburg is delayed by two hours because of inclement weather. I bemoan my fate to anyone who’ll listen on mxit, “Pansy pilots scared of a little drizzle. What happened to gung-ho bravado?”. I bought From My Sister’s Lips by Na’ima Robert earlier that morning before departure, and to file down time, I lose myself in the sincere testimonies of these women and their heartfelt and soul-driven submission to the Will of God. I’m suddenly ashamed of my own stubbornness and begin to strike off what were in fact pyrrhic victories gained in my jihadunnafs. Aluta Continua. Eating eats time, and carrot cake seems like the best way to move along the process. I think of diets and gym routines and then I realise, we all want to lose in order to gain societal approval. What kind of world do we live in, when we have to be less in order for people to like us more? That was my in-transit musing of the day. It feels like I’ve been born in this airport, time is so still and vacuumed. I want Home. But the rain smells earthier in Bloem, like Gaia spilled over her bottle of eau de toilette and a rainbow on the runway reminds me that patience is still very much a virtue in a drive-thru world. You have such amazing writing, I wish you’d update more often! Saaleha, i rem u from Azaadville days. Tink u & my sis Moazza were friends in school. Then Raz & Shaz used to always mention you. Anyways, just wanted to say- u were born to be a writer. I really like ur style. Some of the Egyptian girls will give the tannies good competition! ha ha at the tannies – a universal figure which transcends race, reed, culture, class etc etc…. i have some tannies sitting next door chatting 2 my mum, i just made them a cup-o-tea…. I haven’t been to Bloemfontein in years, yet it’s an hour and a half away from me. I went to an English festival for Free State high school kids in the heart of Afrikaans Land the last time I was there! Woohoo! Your descriptions of the tannies remind me of my school teachers with their elaborate make-up, the “tannies” in my school would always amuse us…and yes they were quite concerned about our boyfriend/girlfriend status! lol! i read this in the early morning today.. and i must admit.. i have a crush on you because of the way you write. I dig small towns. That coffee cup is seriously cute. The way you weaved that description with zen-like philosophy and utter nostalgia… definitely tugged a few heartstrings. I can smell the aroma from over here. Bloemfontein – best memories are of stopovers, always at night, on the way to Lesotho. We lived there. We used to buy hot crusty rolls from a supermarket there, fill it with crisp. This was padkos. Uncomfortable padkos in the car, I can tell you. But the eye make up, I still see it in Zeerust. There’s even a boutique that caters for the tannies, in the building where my sister used to live. Complete with the wide brimmed hats and pleated skirts. But your musings were deep. The less/more concept – I love it! I love your descriptions of those two women. They take shape under the reader’s gaze with a probing finesse. Sigh…You bring the aesthetic to the abyss. Pretty lil picture you paint of bloem.Dont think I will vist though.Have had my share of farm life.Want neon lights,all day trafic jams,unfriendly faces and hustle and bustle.Sad I know but so much easier to hide in.